The jobseeker menu allows you to navigate through the various options in your jobseeker account such as managing your profile, CV, jobs alerts and personal details. The welcome panel gives you an overview of your account. Your application history panel gives you a list of jobs you have applied for. You can click through to the job specifications from here. Your saved jobs panel gives you a list of jobs you saved from the system. This feature is useful if you want to group together jobs you are interested in but have not applied for yet. You can also search through all the jobs on the system from here. Here you can view, edit and set your default CV (More on this feature later in the document). This screen allows you to interact with your CV. To add a CV , click on the “Choose File” button and browse to location of your CV on you machine. When the CV is attached specify and a name for the file and click the submit button. Your CV is now attached to your account which makes it easier for you to apply for jobs on the site. From this screen you can also edit the name of your CV, view your CV and delete your CV using the icons in the “Manage Your CV” box. 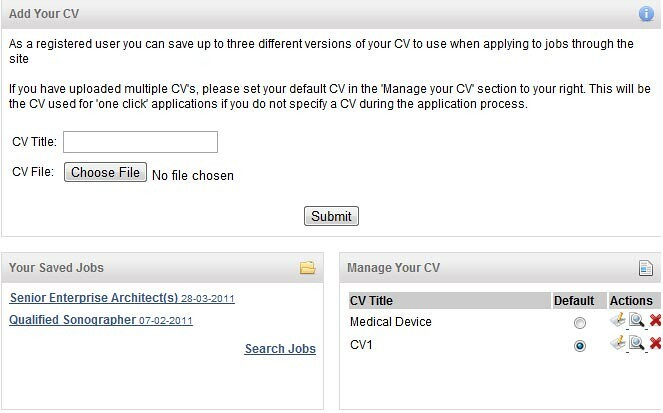 You can upload many different versions of CV to the system and from the “Manager your CV” box you can choose which CV you would like to specify as your default CV (the CV you want to use to apply for a job can also be specified when you click on the”apply “button when applying for a job). 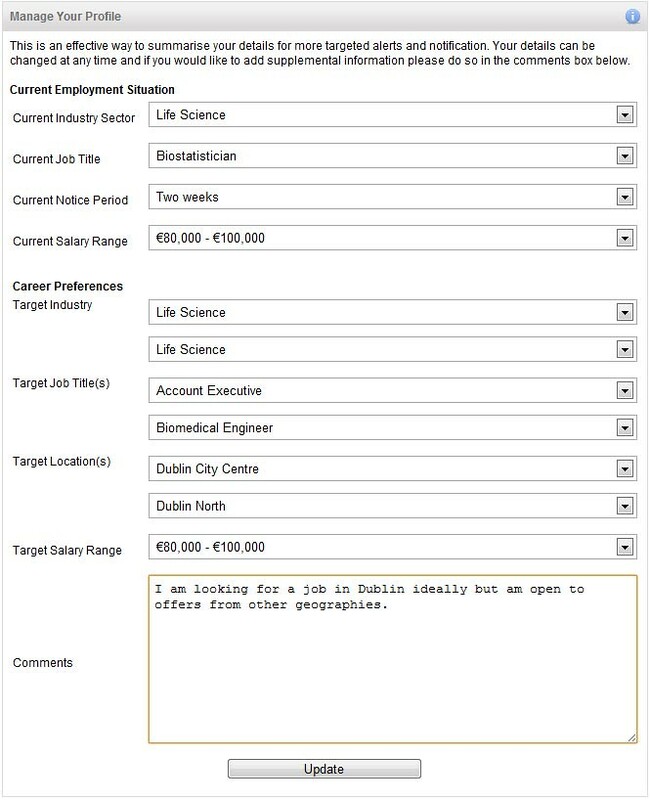 This screen allows you to manage your jobseeker profile, to give the consultant a better understanding of the area you are interested in. Sections include your current industry sector, current job title, target industry etc. To add a profile or update a profile, just enter in the information which best describes you and press the “update” button. A comment box is also provided for any additional information you feel will help the consultant give you the best possible service in your job search. Jobseeker alerts allow you to set up email alerts that will provide you with the latest opportunities in your chosen sector. 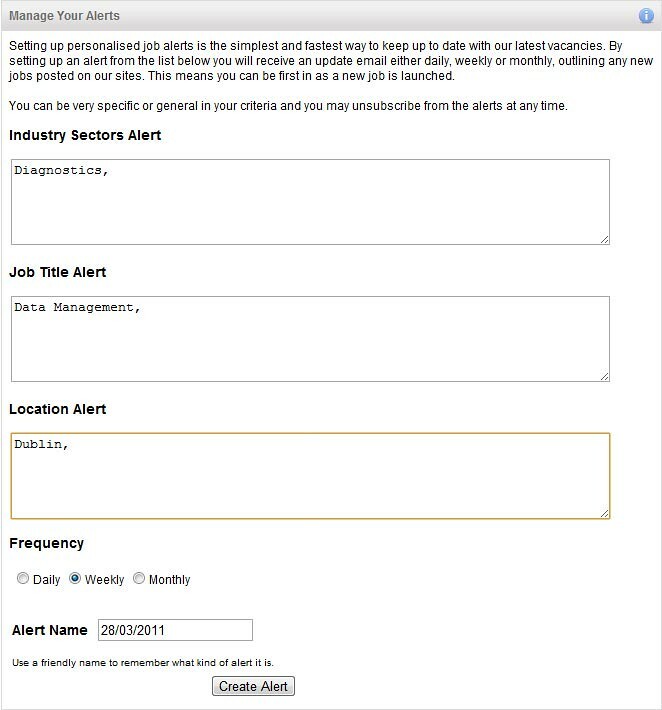 To set up an alert, add the industry sector you wish to be kept up to date in , add the job title for the type of alert you wish to receive and add the location you wish to be alerted to. You may add many sectors, jobs titles and locations to each alert. Then set the frequency with which you would like to receive the email and add an alert name which will appear in the email subject line. Click “Create Alert” and your alert will be set up. On this page you can also delete any alerts you have created. To do this navigate to the “Your Alerts” box, choose the required alert and click on the delete icon, you can also change the e-mail frequency from here. 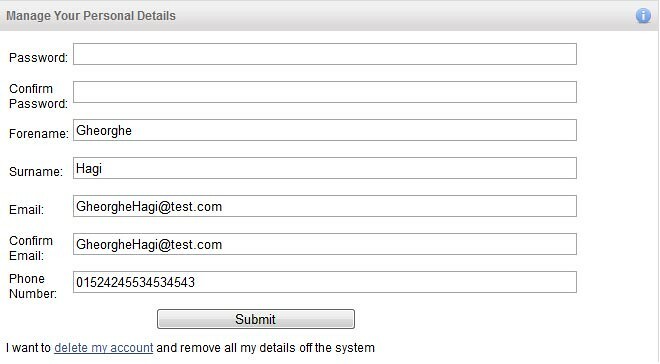 This screen allows you to manage your personal details (name, email address, phone number). You can also change your password in this section by entering your desired password where you are required to and pressing “Submit”. If you wish to delete your account you many do so by choosing the “delete my account” option and following the instructions.